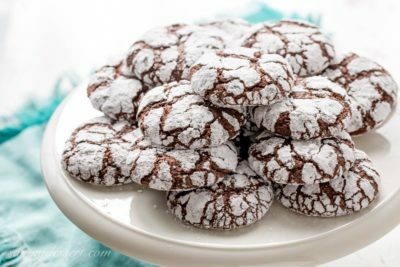 Chocolate Crinkle Cookies are thick, puffy and soft with a deep, rich chocolaty flavor, and they’re so darn pretty too! 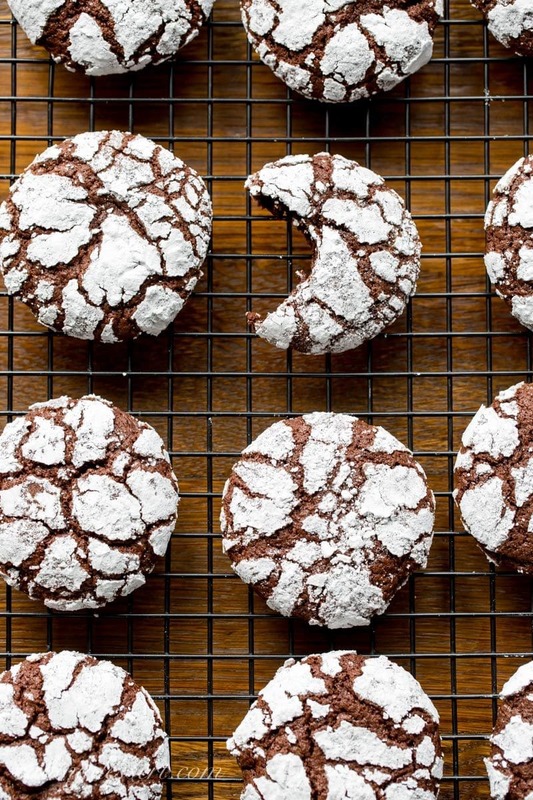 These are no less than chocolate-cookie-perfection and great served any time of the year. 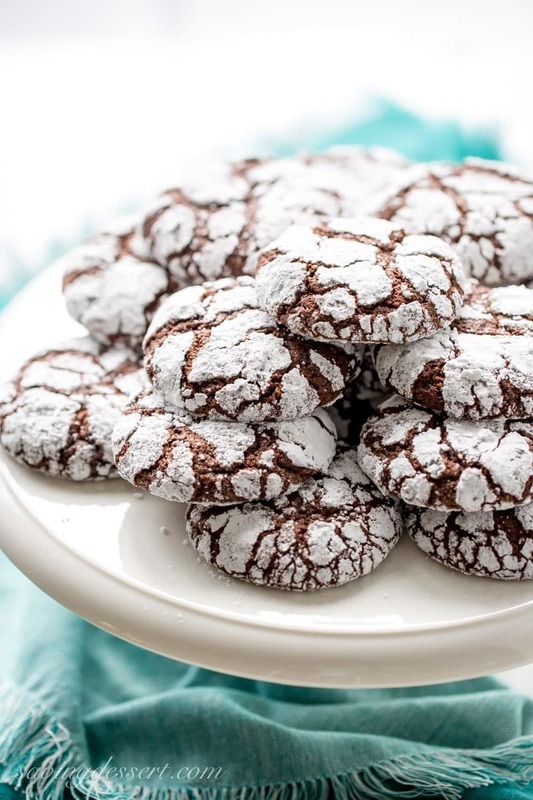 With a wonderful texture similar to a great brownie, these cookies are fudgy with a lightly crisp exterior. Personally I love the powdered sugar coating, especially when you realize it’s all over the front of your shirt, haha. These pretty cookies are so much fun to make … and eat! The cookie dough is rolled in granulated sugar, then powdered sugar, and achieve perfect cracks every, single time I make them. This recipe was first published in a holiday e-book we put together a few years ago, but I never shared it on the blog. For our long-time dedicated readers, here it is again! It’s a recipe worth repeating for sure. 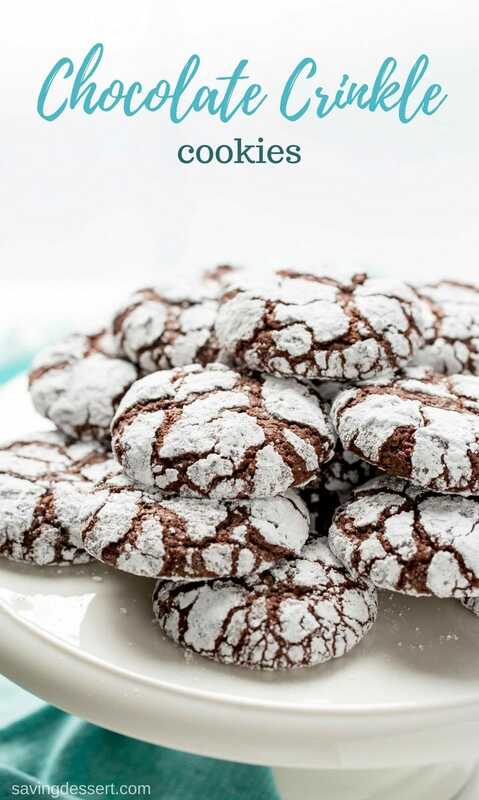 If you’re a fan of chocolate and cookies, you’ll want to give these a try and maybe share with someone you love. Don’t wait for the holidays – these are good year round! I find the cracks absolutely fascinating with each cookie displaying a unique design. The less you handle the cookie dough, the bigger the cracks seem to be. The cracks are like little windows into the fudgy interior, giving you just a glimpse of what’s to come! When baking, the cracks should still appear a little wet when removing from the oven. These cookies aren’t nearly as good when super dried out. My husband always requests cookies as his go to dessert; maybe it’s a guy thing? 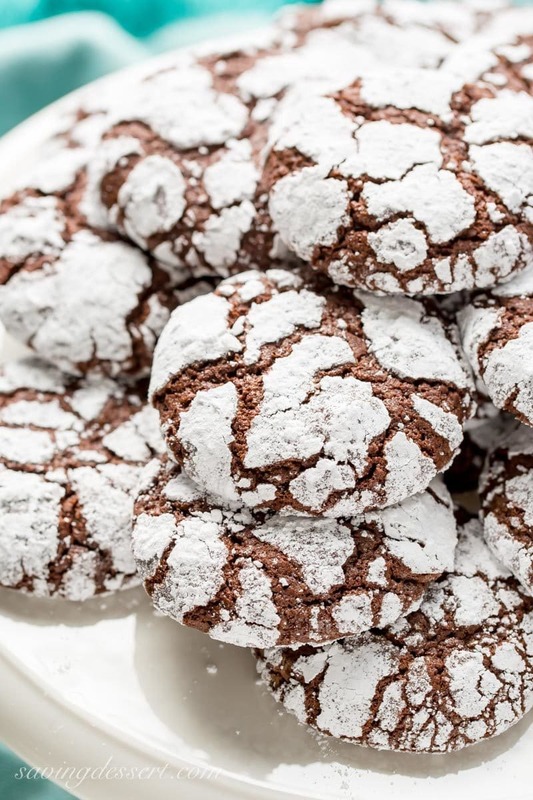 When I mentioned making these Chocolate Crinkle Cookies again, I got a grunt but no sense of excitement like I was feeling. You know how it goes, they automatically think they won’t like something, then won’t keep out of them once they try just one! He certainly won’t let me share the cookies. Mine, mine, mine. Well, he had to fight me for these and I had the upper hand since I work at home 🙂 That’s not always a good thing especially when I have a couple dozen amazing cookies lurking in the kitchen … calling me … by name no less! Besides, I had already touched each and every cookie – so doesn’t that mean I get first dibs? Mine, mine … mine!!!! If you really want to ramp up your chocolate game, stir 1 cup of mini-chocolate chips into the cookie dough. You can never really have too much chocolate, says me! Preheat oven to 325F and line 2 large baking sheets with parchment paper. In a small microwave safe mixing bowl, combine the chocolate and butter. Microwave on 50% power for 30 seconds. Stir and repeat with 15 second intervals at 50% power until almost all the chocolate is melted with a few small chunks remaining. Set aside and stir occasionally until all chocolate is melted. In a medium mixing bowl whisk together the flour, cocoa, baking powder, baking soda and salt. Set aside. In a large mixing bowl whisk together the brown sugar, 1/2 cup granulated sugar, eggs, espresso powder and vanilla until smooth. Add the melted chocolate mixture and continue to whisk until combined. Using a rubber spatula, fold in the flour and cocoa mixture just until no dry ingredients remain visible. Set the cookie dough aside to rest for 10 minutes. While the dough is resting, place the remaining 1/2 cup granulated sugar in a shallow bowl and the powdered sugar in a separate shallow bowl. Using a small ice cream scoop, drop 2 tablespoons of cookie dough directly into the bowl with the granulated sugar. Gently roll the dough into a ball while coating with the sugar but don't use too much pressure or over-handle the dough. Transfer the dough ball to the powdered sugar and roll to coat. Place the cookies on the parchment lined baking sheets at least 2-inches apart. Work quickly to roll all the dough into balls. When the first sheet is filled, put it in the oven to bake. You should have approximately 24 cookies, 12 on each parchment. Bake for 12 minutes or until the cookies are puffy and cracks have formed. The cookies will still be soft and look a little raw in-between the cracks. Allow the cookies to cool for 10 minutes then transfer to a wire rack to cool completely. If you're not a fan of coffee and/or espresso, I recommend reducing the espresso powder to 1 or 2 teaspoons instead of the 3 listed above. You really can't taste the espresso, so don't leave it out all together. It really enhances the chocolate flavor. Chocolate lovers will also enjoy our soft and delicious Classic Whoopie Pies, and these Chocolate Chocolate-Chip Walnut Cookies too. 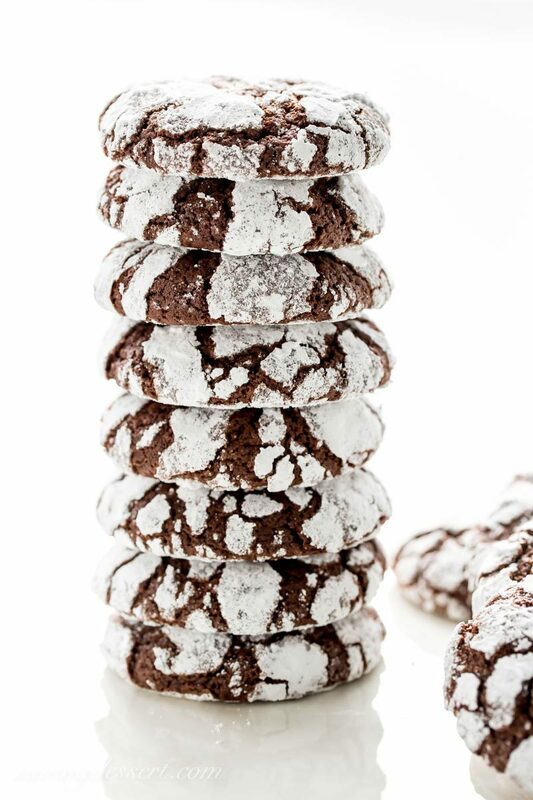 For a gluten-free option, check out our delicious Chocolate-Walnut Cookies. Don’t miss these brilliant Double Dark Chocolate Chip Shortbread Cookies from The View from Great Island – they look phenomenal! 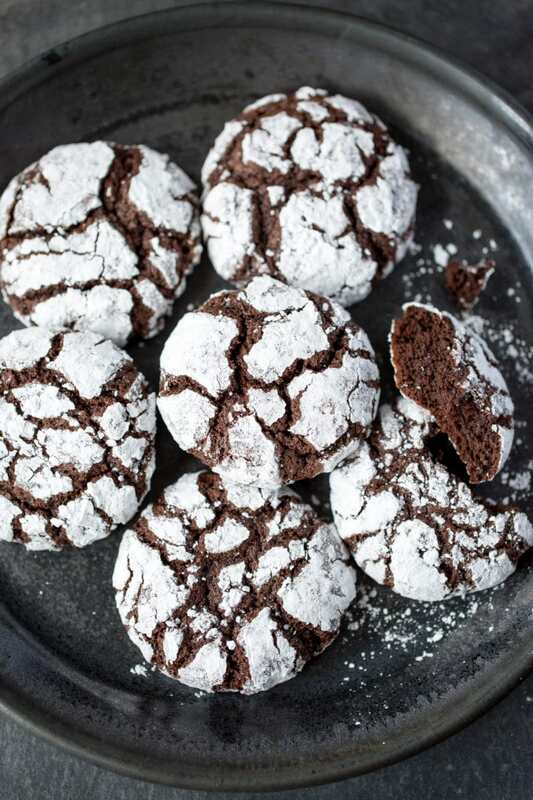 I’m crushing on these big, thick, gorgeous copycat Levain Bakery Chocolate Cookies from Love From The Oven. Another delicious option are these Double Chocolate Macadamia Nut Cookies from Crazy for Crust. So many cookies, it’s so hard to choose what to make next! I would love a few to chase the snow and ice storm blues away today 🙂 They look fantastic, Tricia! I must admit that my favorite dessert is cookies, too. I happen to love these cookies and I don’t care that you touched them! Cookies are just perfect in every way 🙂 I’ve been on a cookie kick lately. We’re in Vienna Austria today – so probably will have to try the authentic Sachertorte! Gorgeous shots, and do you ship, ’cause I’ll take a dozen! Gorgeous cookies and gorgeous photos, Tricia! I too am fascinated by the designs the cracks make. Like snowflakes, each one different and unique! These would be dangerous to have sitting in the kitchen, for sure! Very dangerous – so delicious and addictive! I am going to make these delicious looking cookies as soon as I get over my jet lag. They look so good! Yeah! I know you’re going to love them Gerlinde. Hope you recover soon. Traveling can be hard on grownups like me! Good thing we’re not neighbors or you might have to be fighting me for them too! These cookies are beautiful and sound wonderful! I would share with you if we were neighbors Chris 🙂 Thanks! Chewy, chocolatey and so beautiful! You are an excellent baker, Tricia.